It is well-known -- especially to our readers -- that in Canada and around the world, AVs and CVs will change individual lives, our cities, infrastructure, businesses, government and society. There are also major global business opportunities. Many Canadian companies are already successful in this space and are well-positioned to do even better in the future. The UK has the Centre for Connected and Autonomous Vehicles (CCAV). It also has the quasi-autonomous Transport Systems Catapult that receives government funding, but with considerable freedom in how to allocate those funds. To help move Canada from #7 in the KPMG ranking that measures the AV preparedness of 20 countries to the top 3. To develop a Canadian AV/CV brand and promote our AV/CV capability at a national and international level. In next month's issue, we will unveil a proposed approach to this. Transport Canada has recently made two key announcements in the AV space. First, the department published a news release on August 10, 2018 regarding funding of $2.9M for its Advance Connectivity and Automation in the Transportation System (ACATS) program to promote research and pilot projects for connected and automated vehicles. The $2.9 million is shared between a number of organizations. More information is here. One of the ACATS funding announcements was on August 29th. Catherine McKenna, Minister of Environment and Climate Change Canada, on behalf of Mark Garneau, Minister of Transport Canada, announced a $50,000 contribution for the Unmanned Systems Canada (USC) new Annual National Student Unmanned Ground Vehicle (UGV) Student Competition. CAVCOE's Barrie Kirk is on the Board of USC and is the Project Manager.for the UGV Student Competition His speech at the event described the challenge: "Teams from universities and colleges across the country will design and develop scale models of fully-automated snow plows, bring them to the new AV test track in Ottawa in May 2019, and compete against each other. This will give the students the technical, problem-solving and team-building skills they need to succeed in this era of new mobility services. The second Transport Canada announcement was the Government's formal response to the AV report Driving Change published by the Senate Committee on Transport and Communications. The response addresses each of the Senate Committee's recommendations one-by-one. If you are interested in the policy and regulatory aspects of AVs, it is definitely worth reading. Sidewalk Labs and Waterfront Toronto signed a new 58 page agreement on July 31, 2018 for development of a smart city on a 12-acre site called Quayside in Toronto. The plan includes new street layouts to accommodate a fleet of shared self-driving cars. The agreement is the first public document shedding light on the plans for this project. More information is here. The Sidewalk Labs web site includes conceptual images of the proposed development as well as a brief description of a "mobility system that is safer and more convenient than the private car at much lower cost". The web site continues: "self-driving technology and digital navigation tools can give rise to a next-generation, point-to-point transit system that complements pedestrian, cycling, and bus or rail options to improve convenience, reduce costs, and enhance street safety.". The City of Vancouver has announced that it has received close to $400,000 from the federal government to study the impacts of driverless cars. This a follow-up to previous studies on AV impacts by the City of Vancouver starting in 2016. More information is here. 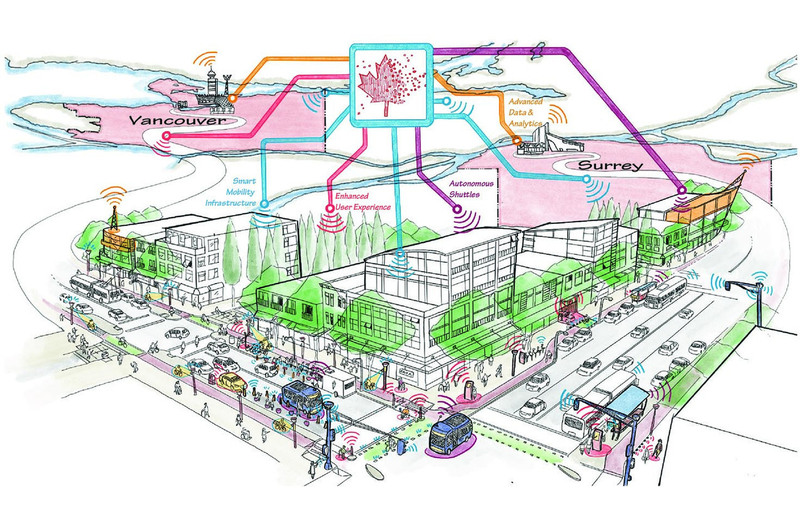 The Cities of Vancouver and Surrey are among the top 5 shortlisted cities selected by Infrastructure Canada for its Smart Cities Challenge. The top prize is $50 million for the winning city. The focus of the Vancouver/Surrey proposal is on ‘Smart Mobility’. Part of the vision is building autonomous vehicle corridors in both cities. More information is here. An autonomous shuttle pilot project will launch in the City of Candiac (south of Montreal) in September 2018. The project cost is $750K with $350K coming from the Quebec Government. The shuttle is made by Navya and the operator will be Keolis. The duration of the project will be 12 months. More information at this link and this link. Ottawa-based ‘Information and Communications Technology Council’ (ICTC) and Carleton University’s Co-operative Education program have partnered to create the autonomous vehicles workforce of tomorrow. More information at this link. In addition, CAVCOE was pleased to contribute to the 2017 ICTC report on Autonomous Vehicles and the Future of Work in Canada. A copy of the report can be downloaded at this link. Unlike some U.S. jurisdictions, the State of Iowa is not allowing trials of truck platooning on that state’s public roads. The main reason is the state’s ‘following-too-closely laws’ (FTC) which stipulate a minimum distance of 300 feet between trucks. Platooning trucks typically follow each other within a 40 to 50 feet distance. More info. at this link. Speaking of FTC, the Competitive Enterprise Institute (CEI) has published its 2018 edition of Automated Vehicle Platooning - A Guide for State Legislators. More information and to download the 66-page report at this link. Ford has announced the creation of the standalone Ford Autonomous Vehicles LLC to oversee Ford’s self-driving and electrified initiatives. This is in response to competitive pressures from Waymo and GM’s Cruise Division. More information at this link. Waymo has been giving a lot of free rides in its driverless taxis in the Phoenix area and other locations. As the commercial launch of driverless taxis gets closer (possibly later this year), Waymo is looking into how much to charge for its services. Waymo is sensitive to its impact on public transportation and is wary of being accused of poaching transit riders. More information at this link. Apple, with 66 AVs approved for testing in California, has had its first crash as reported by CNBC; no injuries were reported. Details are here. Morgan Stanley seem to be very impressed with what Waymo has achieved to date. They recently increased their estimated valuation of Waymo by another US$100 billion, to a US$175 billion. This could in part be connected with Waymo’s newly announced partnerships with Walmart, DDR (mall operator) and Element Hotels – as well as extending existing partnerships with Avis and AutoNation. Finally, Waymo has announced its latest partnership with Valley Metro, the public transportation authority serving the metro Phoenix area. Another startup joins the race to develop self-driving trucks. Kodiak Robotics has secured US$40 million in venture funding to get the project off the ground. Some of the people behind Kodiak are the same people who had a hand in starting Otto self-driving trucks. Otto was acquired by Uber back in 2016 and was recently shut down when Uber got out of automated truck business. More information at this link. CAVCOE's Paul Godsmark was invited to speak on a panel at the Council of State Governments Eastern Regional Conference 2018 Annual Meeting in Rye Brook, NY. He was on a panel with David Strickland (former Administrator of NHTSA) and they discussed AVs and safety, including road crashes, regulations, data, privacy, and related health issues including emissions. And finally, as mentioned in a previous issue of AV Update, autonomy is not limited to ground vehicles. We have mentioned automated vehicles for air and marine applications before. Now you can also add space. The Parker Solar Probe launched on Aug. 12, 2018 is the most advanced autonomous spacecraft ever launched according to NASA. Autonomy arose out of necessity as this spacecraft (heading to the sun) cannot be remote controlled like the Mars Rovers. More information at this link and this link.